Treehouses are nothing new to enterprising kids, but a group of architects at the University of Stuttgart in Germany have brought a new twist to the idea: the first tower made entirely out of living trees. The “baubotanical” building, which measures 9 meters high with a base area of 8 square meters, is made up of hundreds of White Willow plants, which will eventually fuse together to form a single, giant mega tree. Building the structure wasn’t easy. Plants at the base of the building were plugged into the soil, while others were placed in containers attached to a temporary steel scaffolding. When the root structure is strong enough, the plant containers will be removed. And once the structure can carry three steel platforms, the scaffolding will be taken down. The whole process is expected to take between 8 and 10 years, but a green wall should sprout in the coming year. The baubotanical building isn’t just being built for the fun of it–the architects involved are researching both tree elasticity and how trees can grow around steel supports. 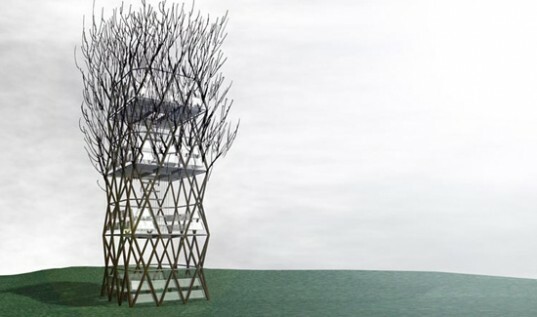 If the living tree tower pans out as expected, the concept could be used as a natural building option for everything from bridges to pavilions to bird-watching stations. Want to check out the baubotanical tower for yourself? The display will open to the public on September 19 in Wald-Ruhestetten, Germany. This concept was mentioned in a trilogy called The Neanderthal Parallax by Robert J. Sawyer. An alternate dimension opens up where Neanderthals survived instead of us and subsequently developed different means of technology. Buildings were grown fairly often to the point that there was usually one available to take shelter in for free so long as you make a contribution to society. A good read. Que bueno que existen remedios para las plagas, los hay desde preventivos hasta erradicadores; lo importante es que el humano imagine, diseñe, plasme y entregue puntos perfectibles de convivencia en la vida terrestre de la manera mas natural y lo mas alejado de la vida artificial. Nuevas generaciones están a la espera de rutas naturales para vivir la vida. Una buena idea sería crear estos tipos de habitat con bambu, una variedad ya se usa como cimbra en las construcciones. Felicito este sitio, lo volvere habitual para mi, mi familia, amigos, vecinos y gente nueva. Un abrazo desde el puerto de Veracruz, Ver., Mex. While this is certainly a testament to the creativity and perseverance of these architects, I'm not so sure I'd like to see bridges and buildings that could be brought down by Dutch Elm Disease or Emerald Ash Borers. 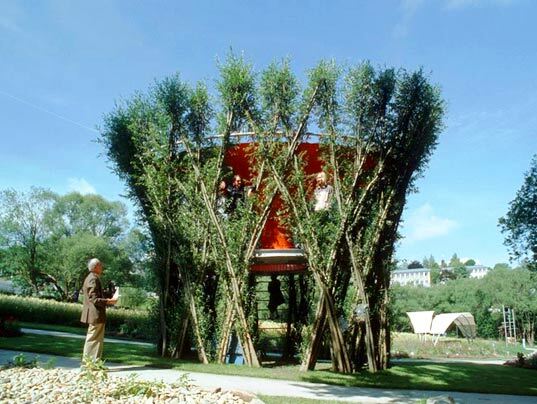 Treehouses are nothing new to enterprising kids, but a group of architects at the University of Stuttgart in Germany have brought a new twist to the idea: the first tower made entirely out of living trees. The "baubotanical" building, which measures 9 meters high with a base area of 8 square meters, is made up of hundreds of White Willow plants, which will eventually fuse together to form a single, giant mega tree.